Outline: Dialogue on the danger of compromise regarding the practices of those worshipping or fearing evil spirits. How to overcome fear of them-- by trusting God, praising and singing songs of praise; by remembering the sacrifice of Jesus and His power. The armour of the Christian; praying in the name of Jesus. 1. I am afraid of the spirits. I do not want to serve them. I do not like to make sacrifices to them. But I fear to make them angry. I want to serve Jesus, but how can I escape from the spirits? 2. I will tell you. First of all, you must be sure that you believe that Jesus is the Savior, the true Son of God. You must believe that He died to pay for our sins. You must turn to Him and trust Him completely to save you and make you a true Christian. 1. Oh, yes, I believe, and I prayed and asked Jesus to come into my heart. He brought me peace and I love Him. But what can I do when the spirits are angry? 2. You must learn what God says, and think about it when you are afraid. God says, "The name of the Lord is a strong tower. The righteous run into it and are safe." That means you must remember the name of Jesus. Jesus is stronger than the spirits. You must say that name, so that you will remember that it is Jesus Who took you out of Satan's power when you trusted in Him. You must ask Jesus to help you when you are afraid, remembering that He is the strong and mighty One. 1. Yes, I see. That is a good thing to remember. 2. Yes. It is also a good thing to praise God when you are afraid. Satan and the spirits do not like that. It brings fear to them when a Christian praises God right in the midst of trouble. They do not want to stay when you sing songs of praise to God. Truly we have so much to praise God for, that we should always be able to say, "Thank you God, for sending Jesus to save us. I praise You that Jesus is the Mighty One, stronger than all others." 1. I am glad to know that. I did not know that praising God will chase spirits away. 2. Yes, but remember that when you are afraid it is not easy to praise God. You must not give up because it is hard. The spirits will try to keep you from it. Then there is another thing that will help. 2. You must remember that Jesus shed His blood on the cross. He made a perfect sacrifice for our sins. He died so that the full payment was made. When Satan tries to make you afraid, you must remember that Jesus paid for your sins with His blood. Therefore Satan cannot keep you. He has no right to you. Then you must remember also that Jesus rose. He could take up His life again because He is God. Thus He defeated Satan by dying and rising to life. Now Satan and the spirits cannot have any power over those who belong to Jesus and who trust Him. People do not remember this, so God has reminded us in His Word that we are like soldiers, and Satan is our enemy. Therefore we must use that which God has given us for protection. God says these are the things that will protect us from all the fiery weapons of Satan. Truth will be a strong belt around us. Our heart will be protected by the righteousness God give us when we trust Him. (When our hearts are clean, we are righteous.) Our head will be protected by the salvation (forgiveness) of God. Then we must take and hold on to the shield of faith. 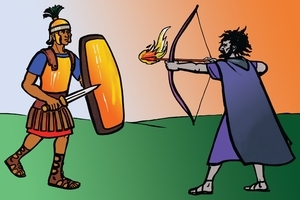 Then none of the fiery arrows of the enemy can get to us because we trust in Jesus the mighty One. God says, do that and stand strong. Do not run in fear, but believe in God's power. 1. My! Now I see that God wants us to be good soldiers and not be afraid. 2. Yes, and there is one more thing to remember. When you pray in the name of Jesus it will make Satan go back. Satan and the spirits do not like to remember that Jesus paid with His blood so that we can be free. You can pray this way: "Thank you, Jesus, for shedding Your blood on the cross. Thank You that Your blood is the proof that I am free from Satan's power. Thank you that Jesus is stronger than the spirits. I am trusting in Jesus. Thank you that the name of Jesus is the highest over all. Thank You that Jesus defeated Satan when He died and rose again." Pray like that and remember that God says this to you: "Lo, I am with you always."